These tasty lollipops are a hit with my kids and everyone we've ever shared them with. The variety pack includes 8 different flavors and are made with organic fruit juice! organic evaporated cane juice, organic brown rice syrup, non-gmo citric acid (from beet sugar, not corn), natural flavors: organic black carrots, organic black currant, organic apple, organic carrot, organic pumpkin, ascorbic acid. They're seriously tasty and I find myself reaching for one every now and then when I'm craving something sweet but don't want too much sugar. I think Amazon has them as an Add-On product on their site, but the 50 pack is small enough to fit in your pantry and will last quite a while, unless you hand them out as Valetine's Day or Halloween treats. We hand these out each year since discovering them and parents always ask where I got them from. 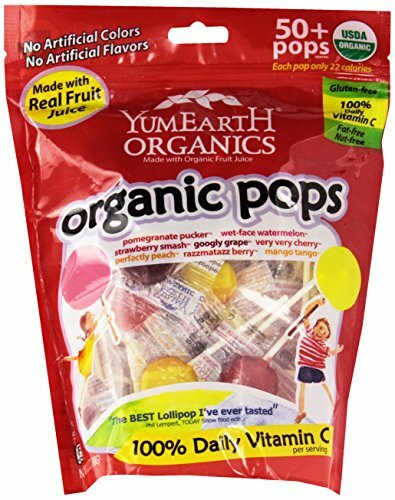 The YumEarth brand also makes organic gummy bears, fruit snacks and other candies kids will enjoy without realizing they're missing all the yucky stuff (like high fructose corn syrup) we want them to avoid. Flavors in this pack include: pomegranate pucker, wet-face watermelon, strawberry smash, googly grape, very very cherry, perfectly peach, razzmatazz berry, and mango tango.